Scientists at a Nevada earthquake lab on Wednesday tested new bridge designs. 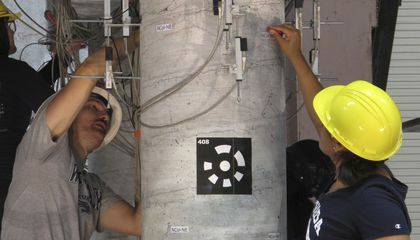 The designs have connectors they say are innovative and were created to better withstand violent temblors and speed reconstruction efforts after major quake damage. University of Nevada, Reno engineers performed the experiments on a giant "shake table." They attempted to simulate violent motions of an earthquake to rattle a 100-ton (91-metric ton), 70 foot (21-meter) bridge model. They wanted to determine how well it would hold up. The tests, conducted a day after a big quake struck Mexico, shook large concrete columns and beams back and forth for about 30 seconds at a time, displacing some nearly a foot before returning largely to their original spot. Graduate students measured and marked indications of tiny fractures but no major structural damage was observed in the initial review of the experiments. "The bridge has done better than we expected," said Saiid Saiidi, a professor of civil and environmental engineering who served as the project leader and has done related research for more than 30 years. Bridges are already designed not to collapse in earthquakes but often are unsafe for travel after big quakes. 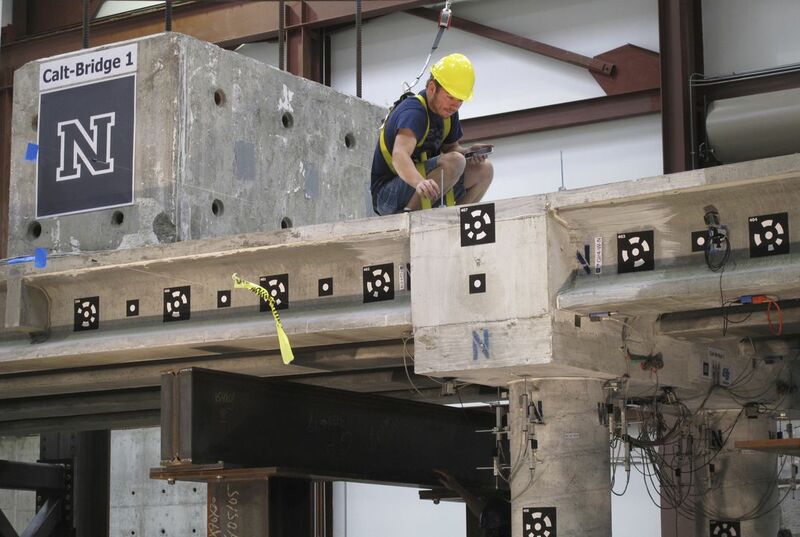 He said the designs that were tested employed special types of connectors to link prefabricated bridge parts, including ultra-high performance concrete. "Earthquakes by themselves don't kill people - it's the structures," Saiidi said. The elements have been tested on their own but never before combined in a bridge model subjected to realistic earthquake motions, like the 1994 Northridge, California quake. Wednesday's test inside the University of Nevada's Earthquake Engineering Laboratory simulated activity of a quake as large as magnitude 7.5. Some design work by the engineers has been incorporated into a highway off-ramp under construction in Seattle. It's the first bridge in the world that uses flexible columns and reinforcement bars made out of a metal alloy with titanium that bends and then springs back into shape when quakes hit. Among other things, the innovative connectors allow for prefabricated concrete and other materials to be attached to an existing bridge foundation so as to speed repair and reconstruction. Part of the research centers on a so-called "pipe pin" connection developed by the California Department of Transportation's bridge designers for use in connecting certain beam interfaces in bridge construction. The pin consists of a steel pipe that is anchored in the column and extended into a steel can embedded in the beam. A gap between the steel pipe and the can enables the extended segment to freely rotate inside the steel can and prevents bending of the protruded segment inside the can.